A pair of petrol stations either side of Eynsham Roundabout. The eastbound one is part of a Tesco Express set-up while the westbound one is a more normal MFG. The former westbound Little Chef. The two petrol stations were built on small parcels of land left over when the road was built. The original Eynsham branch of Little Chef was positioned a little to the west of both of these. It opened in around 1974 and closed in 1986, when it moved to two new buildings. The old one became a bungalow, but is now a restaurant. 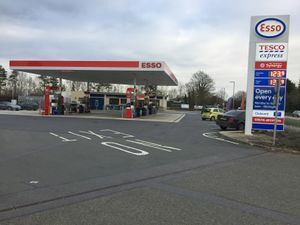 The plan was to build a new restaurant and lodge to the east of what's now Tesco/Esso (a site called 'Wasties Garage'), but instead a restaurant was built at the eastbound services. 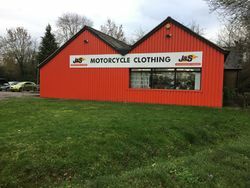 This one gained a Burger King, but became a car dealership after closing in around 2005. At the same time another new Little Chef was built at the westbound services, which opened and closed at the same time. It became a café and then a shop. Meanwhile, in 1990 two different developers also applied to build new services on the A40: one north-west of the Lower Road roundabout and one west of Cuckoo Lane.